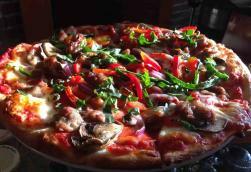 Think Wine Country cuisine, and you think Sonoma County-fresh ingredients, bright, clean flavors, and… pizza. It’s true, since Sonoma County has been home to a thriving Italian population for more than 100 years, many of whom brought their family recipes from the homeland when they arrived as settlers in the 1800s. For the most satisfying pies, ask a local where to go. You’ll likely be directed to a secret spot, La Vera Pizza, which has been sending out savory Italian delights since 1983. The dream of Andres Lignola, a former Italian ship captain, and his brother-in-law Ric Kade, a chef, their formula has been simple: bold seasoning, big portions, and glorious flavors. Today, owners Sue and Ric Kade continue with the tradition, emphasizing artisan crafted pizza, calzone, pasta, panini and gelato, served alongside a large selection of Sonoma County and Italian wines. The star here is what chef Kade calls “the Perfect Pizza,” made even more perfect because you can customize each pie with ingredients ranging from Italian sausage to shrimp, prosciutto, feta and pine nuts. “We top each pizza with whole-milk mozzarella and fresh basil, and then you take this blank canvas and create your own signature pizza experience,” Kade explains. Certainly guests can take chef recommendations, too, such as the Prima, smothered in tomato sauce, roasted garlic and red peppers, green onion, artichoke hearts, mozzarella, zesty green olives and pesto. Some of the pies are Sonoma County-fancy, like the Mushroom Mania topped in red wine reduction-crème fraiche sauce, sautéed Portabellas, white button and crimini mushrooms and smoked provolone; others are simple satisfaction, like the Meat Lover’s layered with Italian sausage, salami, pepperoni, fresh green peppers and mozzarella on a bed of tomato sauce. The classics never go out of style, when digging into savories like an appetizer of pan seared Italian sausage and beef mini meatballs draped in marinara or Gorgonzola cream sauce; toasted crusty crostini topped in melted Gorgonzola and sun dried tomato; or homemade minestrone soup. Chef Kade also likes pastas, putting together comfort favorites like spaghetti and herbed marinara, hearty lasagna al forno, creamy spinach ricotta cannelloni, and sausage-studded baked ziti. These plates bring another welcome classic touch, served as complete meals with house salad or cup of soup and warm homemade garlic knots. Be sure to factor in dessert, too – the Gelato Torta is perfection, as well, layered with chocolate and espresso gelatos, chocolate cookie crust, homemade toffee and hot fudge. La Vera Pizza: 629 4th Street, Santa Rosa, 707-575-1113.